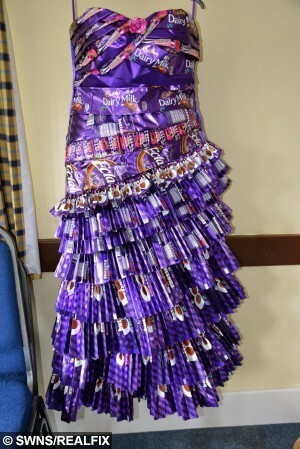 Sweet-toothed Wendy Heagarty looked a treat on her wedding day – in a dress made from hundreds of empty chocolate wrappers. 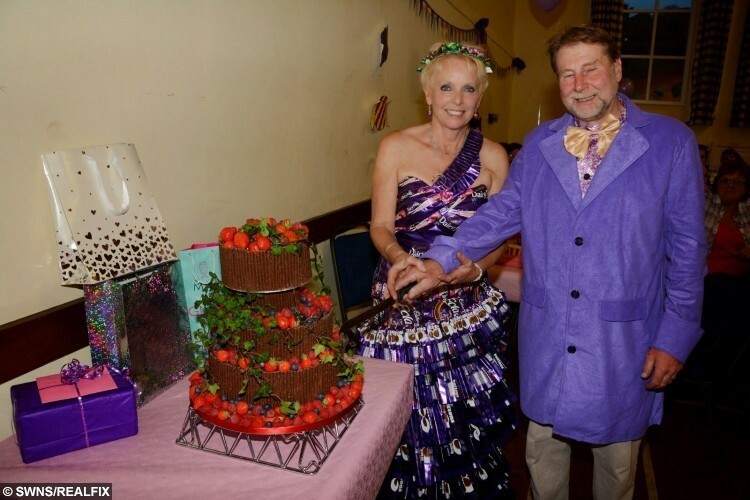 The self-confessed chocoholic wanted a Willy Wonka-themed wedding when she tied the knot with groom Ian. She spent FIVE months gorging on snacks – eating almost her own weight – to collect enough wrappers for her own dress, PLUS trimmings for her four bridesmaids. And incredibly she managed to keep her weight to around 10st and squeezed into the unusual outfit with Ian dressed as Willy Wonka and their dog an Oompa-Loompa. Wendy, 54, a keen cyclist and runner, stunned guests as she walked down the aisle adorned in the skilfully-created sea of Cadbury cast-offs. Most of the wrappers were either glued on or sewn by hand. For the pleats, she glued them onto a ribbon and sewed that onto the dress. Wendy, who has been married once before, has been with Ian, 63, for four years. She has two children, Hannah, 29, and Scott, 27 and he has one son Shaun, 40. “I had had a traditional wedding when I was younger. 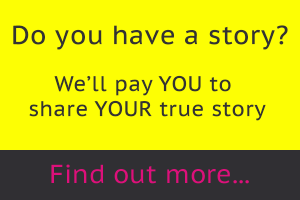 I didn’t want to go through all that again – so just wanted to do something different. “I collected hundreds and hundreds of wrappers for the dress. “I came up with the idea purely because I am a massive chocoholic. I have made outfits out of wrappers before but just small things like short skirts and tops. “But I wanted something different for my wedding so just thought why not make it out of chocolate. Wendy wore a plain dress underneath amid fears that if her creation ripped during the ceremony she would have been left standing in nothing but her underwear. For the bridesmaids she made individual roses from the wrappings to put onto the dresses. These were worn by her daughter Hannah Bathard and granddaughters Lottie and Lyla Bathard and friend Judith Flower. The headgear was also made from sweet wrappers. Wendy began the challenge in January and finished the dressing at the end of April. The couple got married on May 9 at Cockington Register Office before a friend conducted a pagan ceremony at Lustleigh Orchard in Devon. A reception was then held at Lustleigh Village Hall with a barn dance. Wendy said: “We are not a young couple. We live together so Ian has seen me making it from the beginning. “I love all chocolate. My job is as a dog walker and I walk miles a day and am also part of a running and cycling group so I am quite fit. “I do try and watch my weight otherwise I would balloon with all the chocolate I eat. “The guests had an inkling of what I was doing. But I think they just thought it would be tatty and shredded and not as pretty as it was. Wendy collected wrappers from bars of Wispa, Dairy Milk, Button packets, eclairs and a variety of other forms of chocolate. She said: “It was a lot of chocolate to get through but I bought a lot of it at cash and carry.